On Monday, the American Library Association released their “State of American Libraries 2019” report. Among other things that are mostly interesting to librarians, the report included the top 11 most banned/challenged books in 2018. The report lists all 11 titles with the reasons people gave for wanting these books removed from library and school shelves. Fun fact, I bought a copy of this for my niece for her last birthday. I am so saddened by this list because it shows just how under siege our LGBTQ+ population is in the United States, especially our teenagers. If they can’t find acceptance anywhere else, I would have hoped that they would be free to find solace in books that show them that life can get better, that they won’t always be stuck where they are, and that there is nothing wrong with them. The other reaction I had when I saw the list was surprise at seeing Skippyjon Jones. I recall having a great time with more than one of my nieces and nephews at the antics of Skippjon the Cat, though there were places where I raised my eyebrows. I can absolutely see why Latinx and Hispanx people would be upset by the way the books perpetuate stereotypes. But even though I agree that the books are racist (even a little bit racist is still racist), I don’t want these books to be pulled from shelves either. What I wish is that, if a parent wants to read one of the Skippyjon books, they immediately follow it up with something that is more realistic. It’s not an ideal solution, but my answer to problems like this is always more book not less. Removing books from library and school shelves doesn’t make these topics go away. It just makes it less likely that children with questions about them will not talk to their parents or teachers. And the topics on this and previous years’ lists definitely need to be talked about. If we can’t read freely and honestly express our questions or ideas, we will never have the kind of progress we need to ensure that our teens know that being LGBTQ+ is not shameful or wrong; that it’s not anti-cop to expect that police won’t kill you for the color of your skin; or that our society needs to do a better job of helping teens with depression, abuse, addition and other things that are hard to talk about. As a librarian and a reader, I hope that I will always have books around me that might make a difference if I hand them to a reader in need at the right time. America, leave the books on the shelves. Cultivating My Bookish Garden; Or, Is My Library Woke Yet? Every couple of weeks, I run a report in my library’s integrated library system* that shows me how many times books in the browsing collection have been checked out. This collection, which I am in charge of buying books for, is the home of current fiction and popular non-fiction. Reading the report has become a curiously emotional experience. On the one hand, I get a thrill when I see books that I liked get checked out. On the other, I am saddened by good books that languish on the shelf for months, waiting for their readers to come along. My library’s browsing collection has duelling goals. First, it’s supposed to encourage our students to read for fun. Second, it’s supposed to supplement my budget for literature** so that I don’t have to buy just to usual suspects***. This leaves me with a very small path to tread because people (including me) like to read crap. We need our brain candy every now and then. The brain candy doesn’t have a lot of staying power, literature-wise. In a public library, fiction moves in and out of the collection as its popularity waxes and wanes. This is kind of a problem in my library, an academic library, because we are supposed to be building a collection for the long haul. Personally, I err on the side of purchasing books that I’m fairly certain people will read. Even though I push toward the popular end of things and buy the odd volume of brain candy, I also stock my collection with books that critics (and I) think are important. I buy books about immigrants. I buy books about racial and sexual issues. I buy books set in other countries and times to try and broaden the horizons of our somewhat homogenous student population. The problem with doing this is that I start to fall into the mindset of buying more books that people should read instead of books people will want to pick up and read. Consequently, there many books I end up putting on my own to-read shelf rather than on my to-buy-for-the-library list. I am fully aware that my tastes in books are much darker than most people’s. Part of the reason I read so widely because I want to be able to recommend books no matter what a person’s taste in books is, even if a reader isn’t up for something like Preparation for the Next Life, The Execution of Noa P. Singleton, Kindred, or Americanah. My hope is that someone will come along and challenge themselves (or I can talk them into a challenge) every now and then. Until then, I can give them something a little lighter to keep them coming back. I push so hard for challenging books is because I genuinely believe that well told stories can wake people up to the experiences of others, people they might never meet. A well told story can take a reader inside the head of someone who lives a completely different life. Seeing through someone else’s eyes is more effective, in terms of gaining empathy, than a mountain of statistics. I want my collection to be, at least, a little bit woke, as well as entertaining. * An integrated library system stores all of the information about a library’s collection and patrons so that we can keep track of where things are. ** I am incredibly lucky to be in charge of buying all of my library’s fiction. This is very rare. Usually, you have to wait for an elderly librarian to die at their desk before literature becomes someone else’s responsibility. *** Damn you, Joyce Carol Oates, for sucking up so much of my budget! It’s been an awful week, for the United States, for the world. Opening my Facebook and twitter feeds this past week has lead to anxious googling more often than not as I learn who the “thoughts and prayers” are going to now. But! There were two news stories this week that helped restore a bit of my faith in humanity. Both of them are about libraries. Because libraries are public places, they have become a place for people who have no where else to go. Some communities might ban the homeless, but the San Francisco Public Library and libraries in New York have added hours and resources to help visitors find jobs, housing, and counseling. Ignore the stereotypes that journalists like to trot out about shushing and “not just about books” and read about these wonderful libraries. As I read these stories, I thought about the shootings in the news every day and about the trainings we’ve had at my library about dealing with difficult patrons. I don’t want to be afraid of people, always on my guard. The libraries in San Francisco and New York are proof that if we keep the doors open and help each other, instead of turning people away because something bad might happen, we are all the better for it. …all of these make me feel warm, bookish fuzzies. Seshat, Mistress of the House of Books. Luxor. Last week, I lost control of a training I was conducting because I taught librarians how to do readers’ advisory—the art of recommending books. I could not get their attention back. The goal of that particular exercise was to have everyone in a small group (arranged by genres) give and receive a book recommendation. The activity started that way, but quickly turned into four book groups crammed into one room in which the members of each group took turns talking up books and the other members writing down almost every book mentioned. I should have just let them go. I think they could have talked books for the rest of the afternoon. Tomorrow, I’ve got another reference training where I’m going to do roughly the same thing. I expect it’s going to go pretty much the same way, even if this group is quieter than last week’s. Once librarians start talking about books, it takes a mayor’s gavel to get them to stop. I know this from experience. Personally, I find readers’ advisory much more difficult and intimidating than my usual work answering questions at the reference desk. I can find you scholarly articles about just about anything, but finding the right book for a reader on the spot…that’s tough. Readers’ advisory, to me, has higher stakes for some reason. I worry that I might turn people off reading if I recommend a book they’ll hate. I love the readers who will let me fill their arms with books and just trust me—but I know I’m catering to some oddballs in that group. (Hi, guys!) But for someone who tells me that they want to get back into reading or they finally have time to read, I feel the stakes instantly rise. Earlier this year, I wrote about how librarians hate throwing away the strange and useless things that people sometimes donate to us. By and large, it’s true that people send us things that we can’t use and sometimes have to dispose of using the same guidelines one would use for getting rid of hazmat. Sometimes we get something interesting (if only because of the law of large numbers). While I was on the reference desk yesterday, our collections librarian stopped by, handed me a book, and told me there was something weird about it. 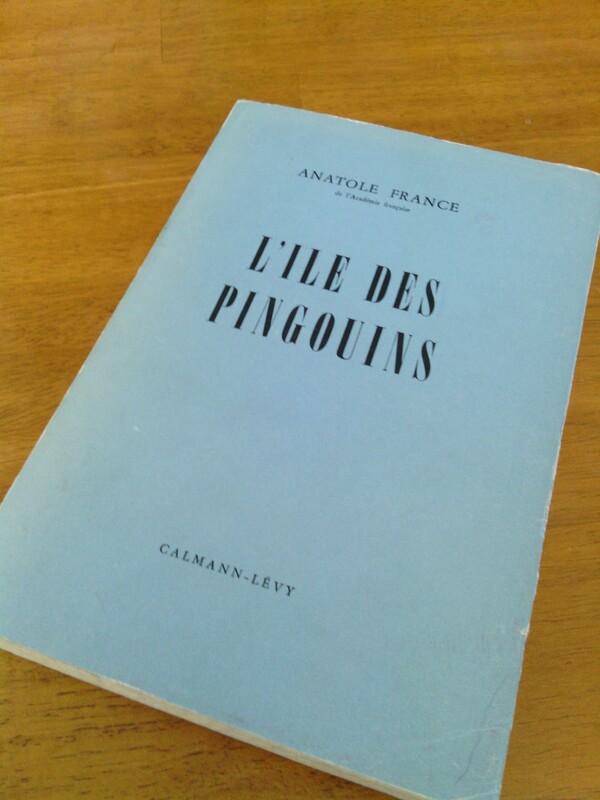 The book is a paperback copy of L’Île des Pengouins, by Anatole France, published in 1908. I’ve seen older books. It’s kind of cool that the book was written by a winner of the Nobel Prize for Literature (in 1921). I didn’t see anything particularly interesting about it until I started to flip through the pages. Well, I tried to flip through the pages. This copy of L’Île des Pengouins had not been cut. This is the first book I’ve ever seen that was never cut. I only know about needing to cut the pages of books the way I know about most things: via fiction. In this case, I remembered mentions of characters reading with knife in their hand to cut open the pages as they went. Not a sign page of this book has been cut. Based on this fact and the sun bleaching on the spine, this book has sat on a shelf for a long time. The process of imposition puts the maximum number of pages on a sheet of paper. After printing, the page is folded (so that it looks like the image below), bound, and cut. A folded, but unbound and uncut, signature. Once the magic had worn off a bit, I started to think about this book as an object. I can’t read French. I’m not going to cut the pages (or let anyone else do so while the book is in my possession). What is a book when you can’t and won’t read the text? Right now, it’s not fulfilling its purpose. By my own internal logic*, I should be as annoyed by this as I am by the books people buy by the yard to match their decor. But I’m not. I suppose that the purpose of this book is no longer to be read, but to teach. 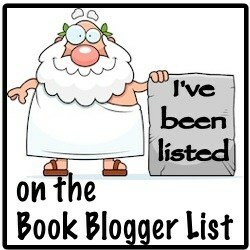 It’s not a book as I define it; it’s a historical artifact. * Go ahead and make your jokes. Librarians help people find information and then send them on their way. We deliberately distance ourselves from what our patrons might do with that information. The distance helps us neatly sidestep a lot of tricky legal and ethical considerations. I admit to being curious about what students end up writing by the end of the semester, but until these last two weeks, I haven’t done much about satisfying that curiosity. These last two weeks, I have been to two readings and a paper presentations. At the first reading, students opened their notebooks and read a terrific selection of poetry. I confess to being anxious about poetry readings. I always end up feeling like I know too much about the poets afterwards. The second reading was of selections from my university’s literary magazine. There was poetry and prose and even a dramatic monologue. One of their stories particularly struck me. I could have sworn that the story was heading towards a miserably cliched ending, but the short work kept on surprising me. One of the poems was full of the cuttingly critical things that a women’s magazine might say to its readers, if it could. The audience laughed at nearly every line, but the poem stung. The paper presentations thrilled me. The papers were written by students in the literature class that I’ve been helping to teach this spring. I taught them how to use the library. I helped them find additional sources. I met with them and talked about how they would use the sources to construct their arguments. The papers these students wrote floored me. At the beginning of the semester, I recall several students worrying about having anything unique to say. Every paper presented this week (half the class) was different. Some were in direct conflict with each other—while still being completely convincing. I was so proud of them. I need to go to more readings and read the university’s nonfiction literary journal. Most of the students I see in the library are at the very beginnings of their college careers or at the beginnings of a project. I won’t see the vast majority of what they produce. The ones I have heard from, however, are brilliant. And I sincerely hope that I see them in print again.